How are we to respond when people reject the truth and turn on us? Some Christian are tempted to attack in retaliation. But others boldly, passionately, and lovingly use Scripture to remind them of the promises of God. 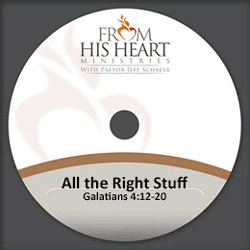 Discover if you have All the Right Stuff and how to use it in this message from Pastor Jeff Schreve’s comprehensive study of the book of Galatians entitled Do You Want to be Free.